French television channel ‘Arte TV‘ has been running a series of behind-the-scenes documentaries on various Comic Book creators throughout the month of January. One of these episodes focuses exclusively on Chris Ware. The website for the series has video clips of every episode BUT Ware’s, though they do offer a nice original flash animation of bits from Jimmy Corrigan (This is not the same animation as the one on the Pantheon site). Anyone who reads this site knows that I have an unhealthy obsession with the work of Mr. Ware, so it should come as no surprise that I’ve managed to obtain a copy of the episode in question. A huge thanks goes to David Pouchard for recording the program and sending me the tape (You can view David’s bibliography of Ware’s work in French publications here). I got the PAL videotape transferred to DVD (Expensive! ), and am seeding a torrent of a small (but watchable) quicktime file containing the entire episode. Click here if you don’t know what a torrent is and follow the directions. Otherwise, you can grab the torrent file here. The show is mostly in English with french subtitles, so don’t worry too much about the language barrier! Also – why the hell don’t we have Art TV here in the US? I’d happily watch it in french if it were available to me. You can download the whole file the old-fashioned way here (it’s being used in a college course, so take advantage of the educational institution-sized bandwidth! ), or view it in three parts here, here, and here. ‘Graffitti’ Artist who OWNS the building he paints on faces jail time for partial recreation of Michealangelo’s Sistine Chapel Mural. Infuriating. I got this email Yesterday. Totally great. Hey I wanted to thank you for inspiring me. Your ridiculous mix CD packaging gave me an idea for a Valentine’s Day gift. Rumor: Adam Carolla leaving ‘Loveline’ over contract dispute? 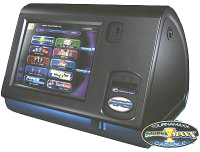 When I first read about the touchscreen and wireless capabilities of the Nintendo DS, the first thing that crossed my mind was how perfectly suited it would be for mimicking those touchscreen games that litter bartops across America. This probably has a lot to do with the minor ‘Boxxi‘ (aka Samegame) addiction I developed a few years back. The primary manufacturer of these games is a company called Merit Industries (Incredible Technologies – The ‘Golden Tee‘ People – offer a competing platform called ‘Touch It‘). Each unit contains dozens of relatively simple 2D touchscreen-controlled minigames, of the ‘ridiculously addictive’ variety. There’s a good page with an overview of all of their offerings here. This seems like a natural project for porting over to the DS, so I’d be surprised if Merit hasn’t already licensed it. If they haven’t, then it’s definitely something that should happen once the DS Homebrew community gets a bit further along. The first step towards making this happen would of course be gaining access to the Merit program data and taking a look-see at what exactly is going on in there. The earliest Merit machines were ROM based, they soon graduated to CD-ROM and have since adopted Hard Drives. The past few years worth of Merit machines routinely sell for close to a thousand dollars on eBay, so it makes sense that there is no shortage of internet banter about cloning them. The consensus seems to be that the data can be copied, but there appears to be some sort of hardware DRM that prevents cloned hard drives from functioning properly in Merit Machines. I’ve seen no mention of anyone trying to examine the data from a programming perspective. Merit’s own Hard Drive FAQ is here. While thinking about my first idea, another one occurred to me. Seriously, so many ideas! 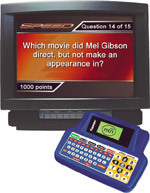 You know that NTN trivia system that some bars / restaurants have? Again, DS coding capabilities still have a ways to go before this would be possible, but its concievable that someone could throw together a similar interface with minimal effort – the only stumbling block would be supplying a large, changing batch of questions. Perhaps a more appealing solution would be for someone to figure out what protocol NTN uses to communicate the questions and answer choices to the handheld units, and devise a way of intercepting the data and parsing it for use on the DS. Let me tell you, that would be ONE COOL DUDE. Pro: Winona Ryder. Con: Keanu Reeves. which included a performance by country stars Big & Rich, dressed in Civil War regalia and flanked by a dancing midget on crutches. Mindblowing.